Compared to last year the race offers more climbs. In between Berendries and Oude Kwaremont are two extra climbs, namely Tenbosse and Eikenmolen. Because of roadworks at the Molenberg the closing climb has been changed. With 32 kilometres left, the not very well known Boembekeberg will feel like a blessing for a lot of riders as the climb is easier than Molenberg. Leberg is the only hill that has to be climbed twice in the 2016 Omloop het Nieuwsblad, as it is the first and the penultimate climb. The first time up the 950 metres Leberg (4,2% on average, 13,8% at max) the race is 60 kilometres old. It marks the beginning of a climbing intermezzo as Berendries (940 metres at 7%) lays waiting without delay and another 5 kilometres down the road Tenbosse and Eikenmolen appear almost back to back. 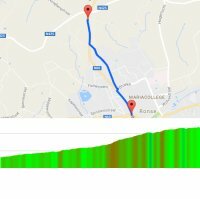 A flat section leads the riders to the infamous Muur van Geraardsbergen, a 1.1 kilometres cobbled climb at 8.7% with a steepest section at 20% – the so called Wall is crested with 85 kilometres done. Almost 20 kilometres onwards the Valkenberg offers 540 metres at 8.1% and another 20 kilometres later the Kaperij brings a 1 kilometres climb at 5.5%. Slowly but surely the obstacles huddle together when Kruisberg appears with 134 kilometres done. At 1.8 kilometres, this is the longest hill in the 2016 Omloop Het Nieuwsblad, while 450 metres of it are covered in cobbles. Kruisberg rises at an average grade of 4.8% and the steepest section is 9%. Following the cobbles at the Donderij – a street meaning something like Thundering –, all hells breaks loose. With 143 kilometres done, the inclination of the cobbles on the Taaienberg is 6.6% while steepest sections are at 15,8%! Next comes the cobbled 1.2 kilometres climb that goes by the name of Eikenberg (5.2% on average, steepest bit at 10%) and only 3 kilometres after this comes the Wolvenberg (a.k.a. Wolves Mountain: 7,9% on average, 17.3% at max), continuing directly onto the 800 metres cobbled sector at the Ruiterstraat. Time for a breather? Forget it! More cobbles lay waiting to be jounced and bounced at the 1,300 metres Karel Martelstraat and the 350 metres Holleweg. After 160 kilometres in the saddle the 2 kilometres cobbled sector at the Haaghoek is the prelude to the two last climbs, as immediately thereafter the second climb up Leberg begins and 6 kilometres later the climbing is over after cresting the ‘harmless’ Boembekeberg. The last 32 kilometres feature 6.1 cobbled kilometres before the race is concluded at a slightly uphill arrival in Gent. Race results/race report Omloop Het Nieuwsblad 2016.